Look at these dogs. After Nia and stretch class once a month we go out for coffee at Peets near the community center. This guy walked up with four German Shepherds. And he just left them as he went inside. It was a sight to see. Four dogs just sitting there calmly. When he came out some of us walked over and asked if we could pet them and I snapped a couple of pictures. I love well-behaved dogs. These girls were awesome. Last Friday was a bird this week I have dogs for the Friday Photo. This entry was posted on September 15, 2017 at 7:35 pm	and is filed under Friday Photo. 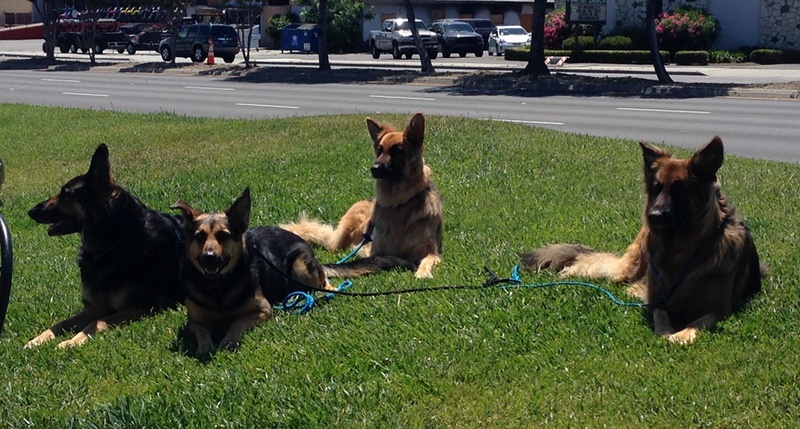 Tagged: coffee after class, Friday Photo, German Shepherds, Nia class, Peet's, stretch class, well- behaved dogs. You can follow any responses to this entry through the RSS 2.0 feed. You can leave a response, or trackback from your own site. They are beautiful. I used to have a dog long ago who looked like the second one from the left. Thanks. They were beautiful dogs! They – dogs – have a way of making it difficult. Those big eyes looking at you, “Like, really? Do you really think I need to be disciplined for pulling all the stuffing out of the cushion? It is kind of cute, you have to admit, me standing here in the middle of stuffing?” Plus it takes a lot of energy because some dogs don’t learn the first time. Also, I think little dogs get away with things easier because some people feel that little dogs are not as big of a threat. Whereas, a big dog needs to know who is boss. With a little dog you can just look at it and say, “Oh really? You think you are the boss?” With a big dog . . . she just might be without having had training! I never thought I would like a long haired GSD, until I got my sweet boy Benelli. Certainly alot of hair to deal with, but they are so lovely. Awww. I don’t think I thought the long haired German Shepherd WERE German Shepherd. I thought they were a mixed breed. I was surprised when I learned. 🙂 German Shepherds are sweet!